Started at the Alta Guard station and ascended Flagstaff. Descended the two dogs path to the flats. Ascended the east facing to the top of Main Days and descended, first traversing east along the ridge for bit continuing down the middle of the gully to the flats and out Days Fork to Spruces. Ascended the back door route to the top of Reynolds, followed the ridge west and descended the west facing into Butler Basin. Ascended to the west reaching the old timer slide triggered several days ago, followed the slide up eventually onto the debris and bed surface, continuing to the ridge of Alexander, then west to the top of Gobblers. Descended the northwest facing off the top and down the middle continuing out Porter Fork. Overcast with mild temperatures and spits and sputters of snow at times. It was cool above about 8500 feet but decent below warmed a good deal with green housing from the fog. Winds were light and from the southeast. 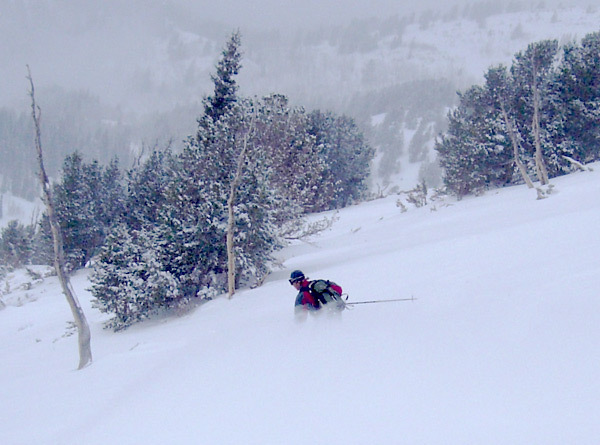 2 to 4 inches of dense snow which seemed to settle rapidly with the reported four inches quickly becoming 2 particularly at lower elevations where rollers were common on the steeper hills with any ski cutting or continuous skiing. Since there was so little snow these presented little hazard. On the shady aspects there are areas without the firm underlying surface and some of these have faceted. 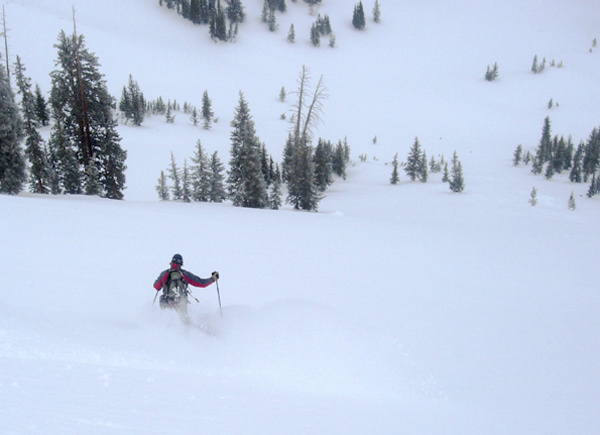 While the new snow is not of a depth to produce slides in these areas it may with continued load. One of the goals of the day was a viewing of the slide triggered sympathetically by a couple of old timers, skiing corn. It was foggy and the view wasn't that great, but the slide was quite large taking out most of the south face. The slide ran on faceted snow under a suncrust. 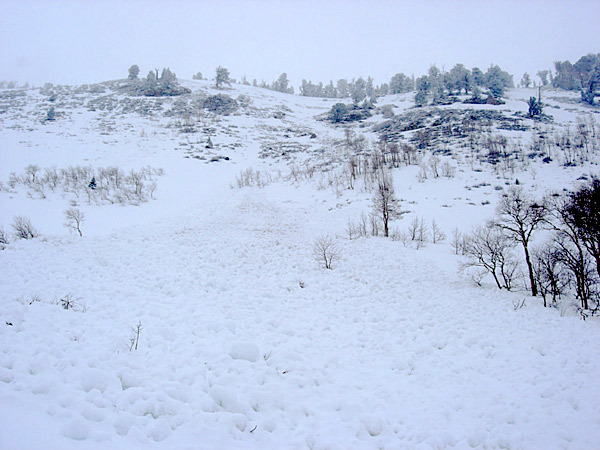 There wasn't much snow, before the heavy wet storm, the slide removed most of it and could be classified as one of the rarities, a corn slab avalanche. 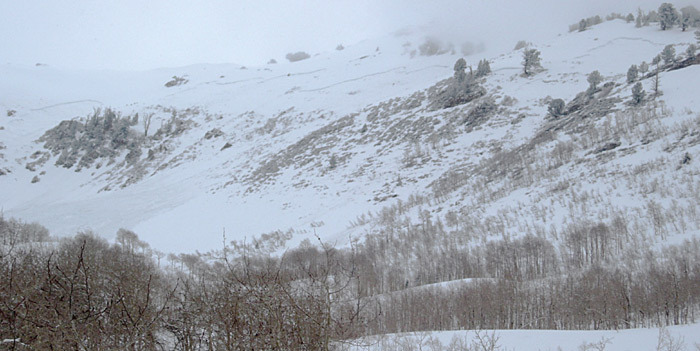 Snow is mostly stable with the most hazard at present remaining a potential of taking a slider on the firm underlying snow surface particularly at upper elevations with a sun crust and on the shady side with a wind packed or boiler plate old snow surface. Hazard could increase in the shady areas without wind affect from faceted snow but predicted amounts at present would make this unlikely.